For your testing start with testing (you can use simple unit tests, like in Mythical Creatures; we recommend mocha and chai) small arrays of numbers and/or letters. The test suite should scale up in complexity. For more advanced testing you will need to generate arrays of numbers to see how large of an array your different sorting algorithms can sort. The test suites between sorts will be very similar; however, be sure to stress-test the sorting algorithms. Some are more efficient than others and can get through larger arrays. How much more efficient is merge sort than bubble sort? Your testing utilities give each test 2 seconds to run. 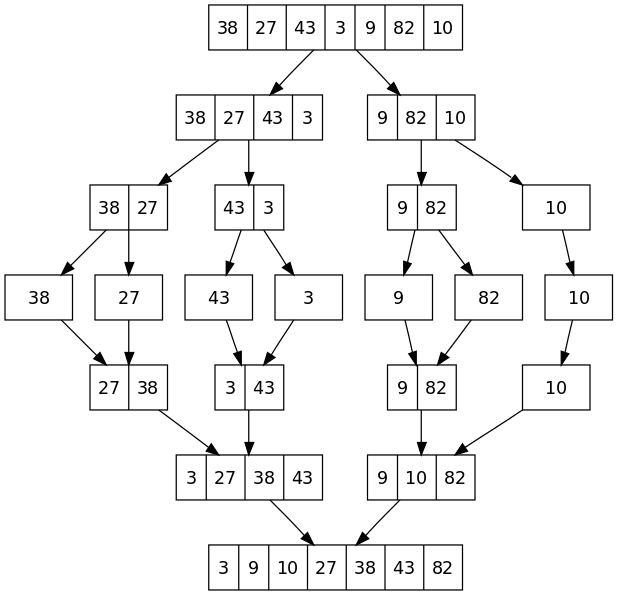 How many numbers can each of your algorithms consistently sort in that amount of time? For a high level understanding check out the wikipedia article. Bubble sort works by moving through an array of data and iteratively moving the largest number to the end of the array. Since 5 is larger than 0 the numbers would be swapped. As we move down the array the 5 bubbles up until it is at the end of the array. Insertion sort is a next step up from Bubble Sort. Insertion sort works by adding items to a sorted array. Typically sorting is done in place inside the array which needs sorting. The first element in the array becomes the sorted array. We iterate through the set to be sorted, pulling one element at a time, then inserting it into its correct position in the sorted section of the array. We pull the first unsorted element, the 4, and compare it to the last element of the sorted set, 1. Since 4 is greater than 1, we add the 4 to the end of the sorted array. We pull the first unsorted element, the 3, and compare it to the last element of the sorted set, 4. Since 3 is less than 4, we swap the 3 and 4. We then compare the 3 with the previous position of the sorted set, 1. Since 3 is greater than 1 we have the 3 in the correct position. We pull the first unsorted element, the 2, and compare it to the last element of the sorted set, 4. Since 2 is less than 4 we swap the 2 and 4. We then compare the 2 with the previous position of the sorted set, 3. Since 2 is less than 3, we swap the 2 and 3. Then we look at the previous position of the sorted set, 1. Since 2 is greater than 1 we have the 2 in the correct position. Since we have no more elements in the unsorted section of our array, we are done with the algorithm. Merge sort is much faster than bubble and insertion sort. It typically has two parts 1: a merge function which takes two sorted arrays and merges them into one sorted array 2: a mergeSort function which splits an unsorted array into pieces so that they can be sorted. It can be solved elegantly with a recursive solution. Merge sort can be thought of as splitting an array into two arrays and sorting the halves by also splitting them in half and sorting those halves by splitting them in half… and so on. The goal of the splitting is to get down to an array with only one item in it. Arrays with one item are sorted and can be merged with other sorted arrays to create larger sorted arrays. For a brief example let’s look at a simple array. The first step would be to split the array into smaller arrays. We then compare those numbers and put them back into an array together. 2 and 0 will swap, creating a sorted split array. With quick sort we take an array and choose one of the indexes as a pivot. We then want to move all the elements larger than the pivot to the right of the pivot and all the items smaller than the pivot to the left. After moving all the elements to either side of the pivot our pivot will be in the correct spot. Now all the larger elements can be quick sorted and all the smaller elements can be quick sorted. Each time you call quick sort it will return a sorted array that will need to be recombined with any previous pivots. Our pivot is in its final location. We can now use a recursive solution to quick sort all the numbers on each side of our pivot. Look into implementing radix sort, one of the most efficient algorithms!